IS REGLAZING RIGHT FOR YOU? Have your fixtures been chemically damaged by drain openers or harsh cleaners? 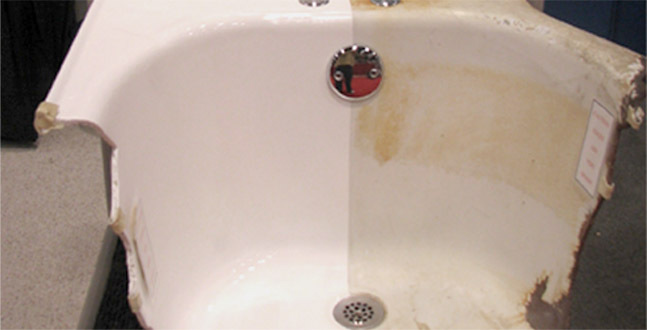 Are your fixtures chipped, scratched, stained or hard to keep clean? Are you concerned about mold and mildew growth in your tile grout lines? Are you tired of old, outdated C O L O R S ? Afraid of the high cost of replacement? You may be asking yourself, "How do I choose a contractor to do my reglazing work? Is there really a difference? Don't they all do the same thing? If you do your homework you will find that there is a vast difference between reglazing companies. "Suffice it to say, your company came highly recommended and we will highly recommend it as well. We are extremely pleased with the outcome. Nice to know there is a resolution to outdated bathrooms!"